Mountaineer Sports Interview with former WVU standout and current Assistant GM of the Cleveland Cavaliers Mike Gansey. The following year, his Senior year, Gansey averaged 18.5 points per game while taking less than 12 shots per game and shooting 59.7% from the field. The Mountaineers went on to make it to the Sweet 16 in the 2006 NCAA Tournament before losing in heartbreaking fashion to the Texas Longhorns on a buzzer-beater. WARNING: This may be very difficult for WVU fans to watch. 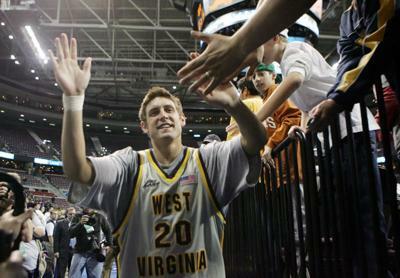 Mike Gansey’s best game ever was also my most memorable game as a West Virginia fan. March 19, 2005. West Virginia upset the No. 2 seeded, Chris Paul-led Wake Forest 111-105 in double overtime. Gansey, playing in front of family and friends in his hometown of Cleveland, Ohio, scored 29 points and had eight rebounds. Kevin Pittsnogle had a off game that night (8 points on 3-7 shooting), but Mike Gansey took the team on his shoulders and absolutely won one of the best games in Mountaineer basketball history. Although it was speculated that Gansey could get drafted in the 2006 NBA Draft with teammate Kevin Pittsnogle, both went undrafted. He signed as an undrafted free agent with the Miami Heat in the summer of 2006 and played in summer league games, but was waived after having a life-threatening staph infection limited his play. He was then drafted as the #1 pick in the NBA Developmental Expansion Draft by the Erie Bayhawks. Gansey went on to play in Europe and China professionally before retiring from the sport. What is Gansey’s best memory during his time at WVU? Gansey is now back home in Cleveland as the Assistant General Manager of the Cleveland Cavaliers, but he is still a huge West Virginia basketball fan. Despite a down year this season, he is confident that Bob Huggins will have them back playing competitively next year. Gansey played under current Michigan Head Coach John Beilein during his time at WVU. What was it like to play for John Beilein and what makes him such a successful coach? Patrick Beilein, former WVU player and son of John Beilein, was recently named the new Head Coach at Niagara University. How does Mike Gansey think his former teammate will do as the Head Coach in Niagara? Does Mike Gansey wish that he had the opportunity to play for Coach Huggins? A big part of his job is scouting talent and he feels that some current WVU players have potential to play professionally. Gansey was named the NBA Developmental League’s Executive of the Year in 2017. As General Manager of the Canton Charge, Gansey presided over a Charge team that amassed a 29–21 regular season record, securing Canton’s sixth-consecutive trip to the NBA D-League postseason as the fourth seed in the Eastern Conference. On July 26, 2017, Gansey was promoted to assistant GM of the Cavaliers, serving under GM Koby Altman. Does he prefer his time as a player or is he happier with the business side of basketball? Kevin Jones, former West Virginia standout, played briefly with the Canton Charge under Gansey. We asked Gansey why he thinks Jones didn’t have a longer, more productive career in the NBA. Also, how important is it for the Cleveland Cavaliers organization that they get the first pick this year with Zion Williamson a part of the upcoming draft class? Gansey describes his time at West Virginia as the two best years of his life. What made it so special and what is it message to Mountaineer fans?